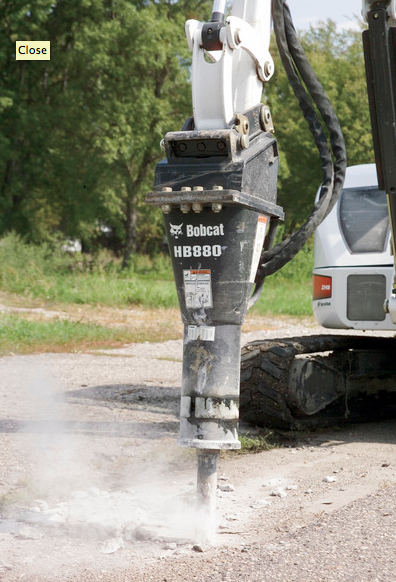 Looking for rent a Hydraulic Breaker Attachment for a Bobcat Mini-Excavator in Rochester NY, Ithaca NY and Western New York? The Duke Company is proud to feature Bobcat Mini Excavator equipment in our rental fleet. Widely respected by professional contractors for exceptional power and hard hitting impact. Available in 60 pound to 1,000 pound impact energy classes. Essential productivity pool to remove concrete and asphalt efficiently. Applications include precision demolition work, interior demolition jobs, flatwork demolition tasks and critical road repair tasks. Impact energy class: 60 feet pounds. Impact energy class: 150 feet pounds. Impact energy class: 300 feet pounds. Impact energy class: 500 feet pounds. Impact energy class: 750 feet pounds. Impact energy class: 850 feet pounds. Blows per minute at: 33 GPM. Impact energy class: 1,000 feet pounds.